Digital branding relies on consistency. From your product descriptions to your customer service responses, the customer should receive your branded experience. Digital branding goes far beyond sticking your logo on everything. However, in e-commerce it’s easy to get lost in the numbers and forget the importance of making a good first impression. Making a positive first impression is the most important part of creating a good customer journey. Your efforts to continue that experience through the course of their buying journey are important, but will be useless without the hook of that initial good impression. I’m going to take you through some digital branding trends that are currently making real impact. Test them out for yourself. These trends will help to keep your brand relevant in the digital space through 2019. Millenials are people born between 1980 and 1995. They’re in their mid twenties to late thirties. Most of them have responsible jobs and children. Their frivolous youth is over. The newest generation is Generation Z. People born between the mid 90’s to the early 2000’s. Over 25% of the US population are generation Z. The oldest members of this generation are now in their early 20’s and have begun their first jobs. Their buying power will only increase from this point forward. Your brand will need to shift digital branding strategies in order to accommodate this demographic. Not only is this generation the most up-to-date with current trends and internet language, they’re the first generation born into the digital age that we grew into. They’re more knowledgeable when it comes to navigating and buying from online retailers, and the quickest to spot a scam. To sell to this generation you need transparency, a fast, easy to shop website, and a genuine story to tell. Stories of hacked accounts and online scams only seem to be getting more regular. It’s more important than ever to reassure your customer base that you’re a legitimate business. Potential customers are constantly looking for any signs of dishonesty. Anything you can do to reassure customers at the beginning will lead to a more enjoyable buying experience for them, and more sales for you. What may cause your visitors alarm? Your website design, sales copy, ad design, and even the quality of images or videos you use to promote products are all possible suspects. In addition, visitors also look at customer feedback and the frequency with which you engage with your customers on social media. Confidence used to only matter at the point of sale and the purchasing experience. Now, customers can provide their feedback in real-time, so you need be ready to address concerns the moment they arise. A chat function with customer service advisers ready to answer questions is a valuable asset to any e-commerce website in 2019 . Fake news floods Facebook, Twitter, and Instagram. There are endless articles with click bait headlines and ads stating “free product worth $20” when in reality $20 is added to the shipping costs that remain hidden until the last minute. This noise has trained users to be increasingly unresponsive to anything they deem too good to be true. It has also turned customers towards trusting individuals over faceless brands. 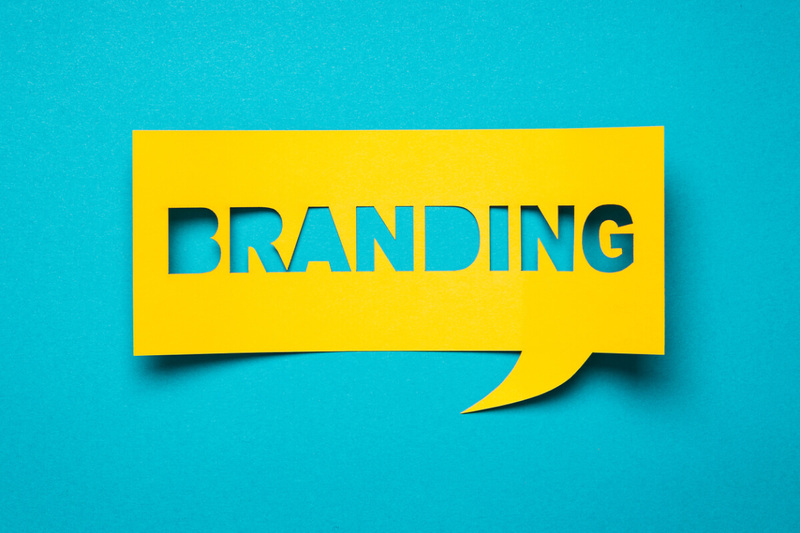 Successful brands have taken notice, and are implementing digital branding and marketing tactics that emphasise the human aspect of their brand. They speak to customers like friends instead of clients, responding to their messages with enthusiasm and kindness. You must be prepared to deliver exactly what your customers expect based on what your offer promised. Be honest about what you’re providing. Don’t hide any details when telling customers what you need from them or what they should expect. With social feeds being so noisy, it takes a lot more than a product image and a few emojis to make your offer stand out. This is how most social media influencers build huge followings and market their offers at the same time. 90% of these profiles are filled with relatable and amusing content and stunning photos to captivate the viewer and gain their following. Take a travel account on Instagram for example, the visitor doesn’t necessarily follow because they love every photo or would want to visit every location. Rather, it’s because of the overall consistency of the page’s content. A good social account provides 90% value and only makes a sell or an ask 10% of the time. This builds rapport with followers and creates opportunities for future asks to be well-received. Below are two examples of brands that provide value first. Selfish Mother publish articles their target market of mothers can relate to, often written by bloggers who will further the brand’s reach through their own following. In addition to this, founder Molly Gunn often shares unfiltered shots of herself, her family and her travels. Sharing topical and engaging content gets high interaction for the brand, and behind the scenes shots of the business and it’s founder only make the brand seem more genuine and transparent. People don’t feel they are buying from Selfish Mother, they feel they are buying with them. When Selfish Mother post new products, they often sell out in days. 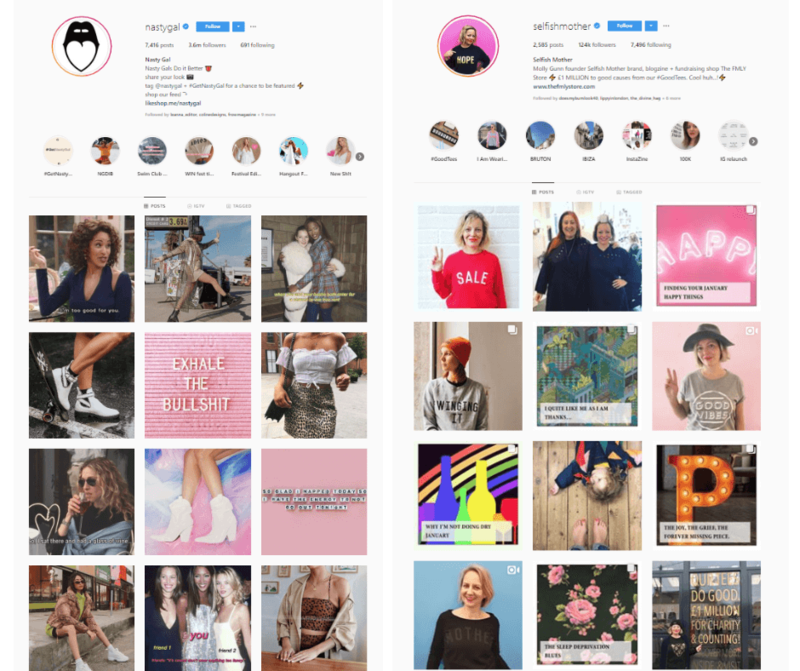 Nasty Gal are a fashion brand that built a social media following of millions, and so definitely have lots of lessons to share. Out of the 12 posts in the shot below, only 4 direct customers to buy. Most posts are quotes and memes that their target market enjoy and like to share. Both of these brands are doing the same thing. Using in depth knowledge of their buyers to create banks of content they know will attract them to follow. Most of the consumers you’re going to reach are searching for a product to help them solve an issue or improve an area of their life. Normally, the sale ends with us providing the solution. The best we can hope for is that we’ve provided a good enough experience for the customer to return. If we’re lucky, they’ll leave a positive review. Successful brands in 2019 aren’t willing to end the relationship there though. Returning customers are easier to convert than new prospects. Brand awareness removes most of the hesitation a buyer has when purchasing a new item, and knowledge about the product can help solidify their “need” to acquire it. In the past year alone, Facebook Group membership is up 40% reaching 1.4 billion people . More than half of Facebook’s massive user base now use groups every month. Of those, 200 million people belong to so-called “meaningful Groups,” considered a vital part of users’ daily lives. Mark Zuckerberg has said he’d like to see 1 billion users in “meaningful” groups within five years. With business page reach dropping and Mark Zuckerberg himself championing groups, it’s probably time for all businesses to look at opening their own groups. Starting a Facebook group allows your brand to establish itself as an authority in your niche. A community can be spread across social media, but Facebook groups provide great homes for communities. Having moderators in your group answering questions in real time builds trust as well as an emotional connection to your brand. Giving customers a place that they can exchange information and tips on how to better use your product creates a community—a family hosted by your brand name. The best marketing you can have is praise from a verified customer. Amazon reviews are all the proof we need for that statement. Word-of-mouth can make or break a business, so provide everyone with the best customer experience they’ve ever had. Most of these trends have been used to some extent for years by companies outside of e-commerce, but are only now catching on with retailers. Don’t worry if you’ve not done any of the things we have just gone through, you have time to evolve your brand. The one thing that all the best examples of digital branding have in common is that they never stand still. The ever changing environment online means brands that fail to change, quickly die. Trust your knowledge of your niche, trust your gut, and above anything else – trust your customers. They will tell you what they want. You just need to ask, listen and change. Take what you’ve learned here and build your brand into the caring and knowledgeable brand you know it to be. Customers will appreciate the extra effort and repay you for doing so.